The LG V40 ThinQ with five cameras and a notched display is official. As we have all been expecting, the smartphone comes with the latest high-end hardware with LG's special features. But of course, the main focus is on that triple camera on the back of the V40. Even the design of the latest LG smartphone has stayed the same: The 6.4-inch OLED display (QHD+) is in 19.5:9 format. It has a notch and slightly wider edges and a slightly thicker chin. It is in a waterproof casing with a metal frame and a glass back. The back of the V40 is curved and houses the triple camera and the fingerprint sensor. The camera is also the real star of the LG V40 and marks the biggest difference between this and the LG G7. A normal 12-megapixel sensor (f/1.5 aperture, 78° angle) has a lower resolution than the one in the G7, but its pixels are 40 percent larger and should, therefore, capture more light. A wide-angle sensor with 16 megapixels (f/1.9 aperture, 107° angle) is added as well as and a telephoto lens with 12 megapixels (f/2.4 aperture, 45° angle) for double optical zoom. With this triple camera setup and the dual camera at the front, the LG V40 currently offers the greatest variety when it comes to taking photos in a variety of ways. Of course, the manufacturer has also thought about special features. For example, it is possible to add a thumbnail view in the camera app that displays the fields of view of the three different cameras. If you still can't choose the right camera, there is also a Triple Shot feature. When the shutter button is pressed, a photo is taken with all three cameras and users can then select their favorite. In addition, an animation with zoom effect is created on it, but as you can see on this video by MKBHD, it looks rather weak. According to a first review by The Verge, the function will be more of a nice gimmick than something really useful, since the shots are not taken at the same time, but one after the other. Even small movements of the subject or the photographer can worsen the result. The main camera is reported to sharpen colors too strongly but we won’t know for sure how this performs compared to the high-end competition until we can do our own tests. The same applies to the dual front camera, which consists of an 8-megapixel sensor (f/1.9 aperture, 80° angle) and a 5-megapixel sensor (f/2.2 aperture, 90° angle). Both cameras feature a portrait mode with light effects like the iPhone XS. And, of course, the ThinQ models also come with AI that recognizes your subject and makes the appropriate tweaks to the settings, or tried to conjure up more light in the picture in poor lighting conditions. Under the hood of the LG V40 is the high-end hardware we expected. The processor is the Snapdragon 845 with 6 GB of RAM and either 64 or 128 GB of expandable storage. The battery is a 3,300 mAh that can be charged wirelessly. WLAN n, Bluetooth 5.0, USB C, NFC and an FM radio are also included as standard. In addition, there are features such as the boombox speaker, 32-bit Hifi Quad-DAC, a 3.5-millimeter headphone jack, facial recognition via the dual front camera and also a Google Assistant button on the left side of the device is again included. As with previous models, the housing is IP68 and MIL-STD 810G protected against water and dust. 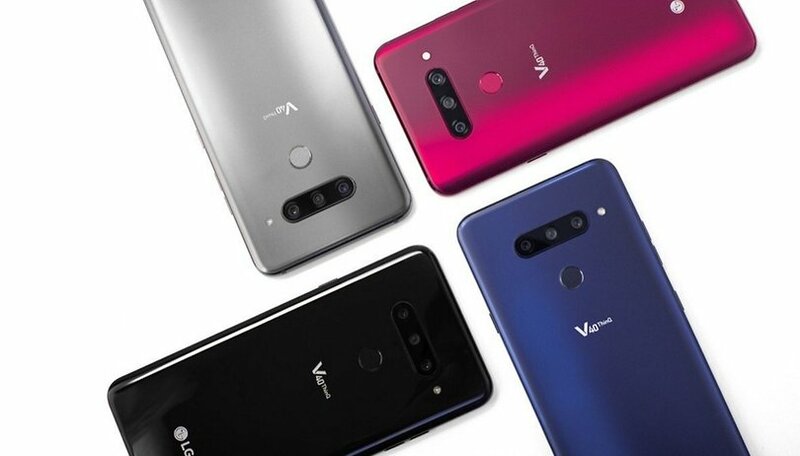 The LG V40 is available in the colors New Aurora Black, New Platinum Gray, New Moroccan Blue and Carmine Red. In the US the LG V40 is available from October 18, 2018, and prices start at $900. What is surprising, is that the V40 still ships with Android 8.1 Oreo and isn't already equipped with Android Pie. Given LG’s of the past, the update policy is rather meager, so you will have to wait for the latest Android version. LG didn't get carried away with statements about the update schedule. What do you think about the LG V40? Does the smartphone have the potential to compete with the competition? Let us know in the comments. I like this phone. My carrier is Verizon & it's priced at 980.00+ tax. To tell you the truth if I'm going to spend a g-whizz I would rather go for the note9. To me it's just a better value phone & better equipped!